Minterviews 2013: Giannis Milonogiannis | Thought Bubble 2018 runs 17th - 23rd September! Did you have a nice vernal equinox? I went to school with someone called Vernon Equinox, but he was no relation, and that’s a whole different story for another time! The Thought Bubble 2013 guests pages! The Thought Bubble 2013 New Dock Hall exhibitor pages! The Thought Bubble 2013 Royal Armouries Hall exhibitor pages! All of which are slowly, but surely, getting crammed to the gills with some absolutely brilliant comics creating talent. It’s gonna be a fun ol’ time in the city of Leeds this November. BOY HOWDY! If you’re yet to send over an icon then please do, you can see all the details of what’s needed on this page, and if you missed out on a table, then you can sign up to our reserves list here. Now, every year, we like to have a chat with some of the wonderful creators that we get to meet through the festival, and pop the transcripts up online. We ask the same 5 starting questions to everyone, and then figure out 5 more questions from their answers to those to form a mini-interview, a MINTERVIEW! We also call them MINTerviews because reading them is like inhaling a cool blast of mountain air for your mind grapes, and leaves your noggin minty fresh. For any neurobiologists in the house, please don’t email in, we’re just having some fun. WHY YOU GOT TO HATE? 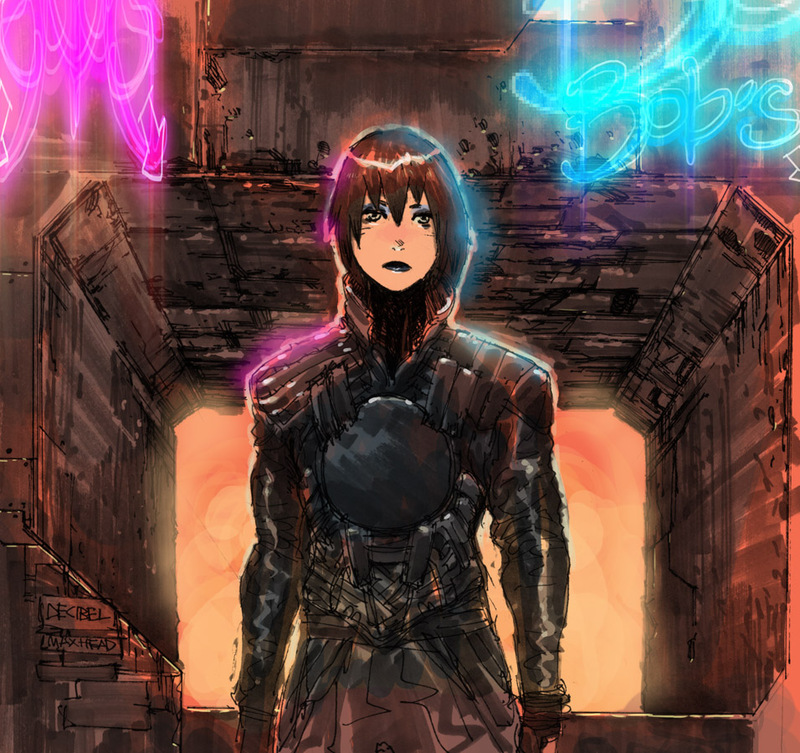 This week we’ve been talking to Giannis Milonogiannis, the excellent creator of cyberpunk webcomic Old City Blues, and whose (awesome) work can currently be found in Prophet and Spera, the collections of which are both worth picking up, as they’re firm favourites here. You can see what we chatted about below, and for more of Giannis’ work you can check out his website, or his art tumblr. TB:Hey Giannis! So, to open, can you give us an idea of how you got started in comics? Did you get a big break, or was it more gradual? GM: I sort of gradually scammed my way into comics – I got started doing small things locally in Greece, before putting up Old City Blues online in 2010. I suspect most people have found out about my stuff through Prophet, though. TB: And how long were you publishing OCB online before Archaia expressed an interest in putting the book out? How did that come about? GM: The book was online for about 7 months before Archaia found it – I had actually submitted it to them when they found it online themselves around the same time. So it’s like the book worked itself out in that way. TB: So, do you prefer working on projects like OCB that you have complete control over, or collaborative projects with other writers/artists like Prophet and Spera? GM: Both are great for different reasons, I suppose – and doing one helps you better understand the other. Working with a writer is infinitely easier, most of the time, but I like to be able to show readers something like OCB and know it’s all my own, for better or worse – the characters and situations in a solo project are part of the creator in a different way than on collaborative books. It’s a totally different feeling. TB: What’s your proudest moment, in comics or otherwise, to date? TB: And does that feeling of satisfaction become addictive after a while then? Do you think it’s that high that drives you to create, or do you just like telling stories? GM: I think the cartoonist’s high is addictive even if we don’t realize it at first. I’d like to say it’s solely the stories that push me to make comics, but I’d probably be trying to write novels or something if that were true. The high I get from being in the zone while drawing or from just having finished a book is a big part of the fun in making comics. TB: Do you enjoy attending conventions and other events like Thought Bubble? GM: Definitely. I’ve only been to two or three because I live a ways from everything, but it’s been fun the times I’ve been. It’s fun to see people walking around for an entire weekend in a constant state of excitement. TB: So, did you ever go to any conventions as a fan, when you were still trying to break into the industry? Do you think showing your work at events can help when you’re starting out? GM: I did go to a convention in the States in 2010 purely as a fan trying to break in. It was great to finally get to meet people up close, and see their immediate reactions to my work. It’s definitely something that helps you grow more comfortable with being someone who draws to be in such an environment. TB: And as a comics fan – which titles are you enjoying at the moment, any all-time favourites? GM: Some favorites: Adam Warren’s Dirty Pair: Sim Hell, Yukinobu Hoshino’s 2001 Nights, Hugo Pratt’s Corto Maltese, obviously anything by Shirow and Otomo. Right now I’m going back and reading a lot of Tezuka, Golgo 13 and 90’s X-Men stuff. I should really read more current books. TB: Do you have any characters, that aren’t your own, that are particular favourites to draw? Any that you’d jump at the chance to work on a title featuring? 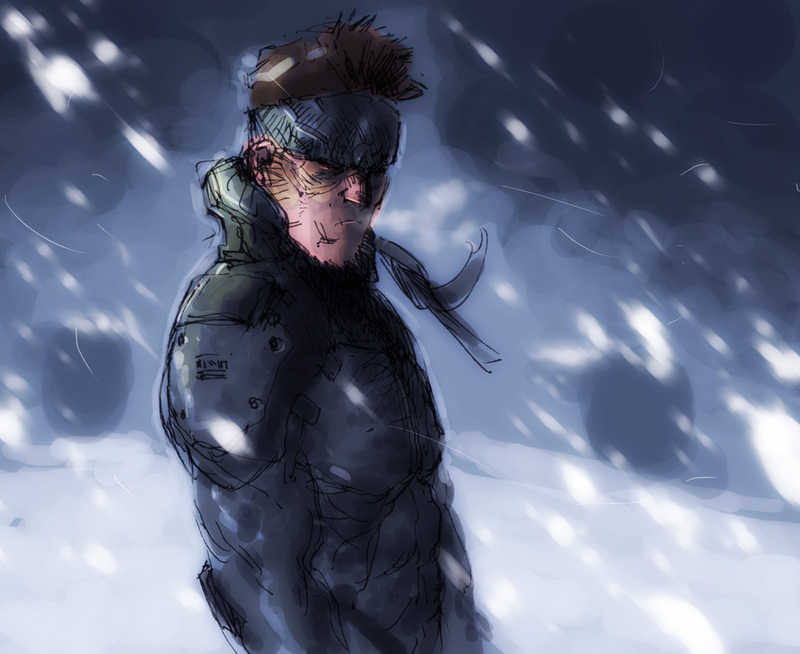 GM: I draw too much Metal Gear Solid fan-art probably, but I don’t know if I could draw a decent book of that. It’s definitely the first thing that comes to mind, though. TB: Finally, thought bubbles or caption boxes? GM: Both – in my head they’re two entirely different things with their own use. I don’t see how we can ban the use of thought bubbles – it’s like saying we can’t use red in our comics anymore. We’d like to say a massive thank you to Giannis for taking the time to talk to us, and you really should check out the excellent free-to-read cyberpunk awesomeness of Old City Blues. It’s ACE. We’ll have another Minterview for you next week, as well as more guest and exhibitor updates, so be sure to check back, check in, and check it out.